Finished Jul 2018. Final score: 5 / 5. This is my new favorite horror novel. Charlie Manx drives a 1930s classic Rolls Royce Wraith (vanity plate NOS4A2) with supernatural powers. He drives around abducting kids (he has a code: only from bad parents - he says he is "saving" them from a bad life) to take to Christmasland, a place where sorrow drains away and leaves only joy. It is happiness and Christmas every day forever. Victoria McQueen has her own supernatural vehicle and managed to escape Charlie's abduction as a child. Now, Vic the adult, faces Charlie Manx again as he attempts to abduct her child. I have nothing but praise for this exceptional book. It is well executed, enjoyable, and has believable characters. It is a horror novel with a fantasy hook instead of just a pile of gore. Charlie Manx - This guy is very creepy. He is a true serial abductor: he legitimately believes he is doing the right thing. After all, what child would not want all their unhappiness removed? The kids were going to have a horrible life with their bad parents. He is giving them Christmas instead. Bing Partridge - Recruited by Charlie Manx to be his lackey, Bing is a very scary character. He is both mentally disabled and mentally disturbed. He may be a worse Charlie if he was capable of independent thought. While Charlie takes the kids to Christmasland with a flawed moral code, Bing is busy doing horrible things to the children's mothers with no remorse. Vic McQueen - The protagonist of the novel. What I particularly like about her is she is full of character flaws. Though her heart is in the right place, she has a pattern of self-destruction and poor decisions. Total perfection in thought and actions was my main complaint for Cassandra in Dare Mighty Things. Vic is no role model. She drinks too much, has a child out of wedlock, spends time in the psych ward. Her redeeming quality: deep care for her child and the general well-being of others, carries her through the novel. Maggie - I am just dropping this character in here because she was very enjoyable. Can you imagine a character so self-destructive that even the psychotic Vic attempts to disassociate with her? Lou Carmody - The epitome of the Beta Male. He is obese. And not very bright. He has barely enough mechanical talent to get by fixing small motors. However, he does care a lot about Vic and did help her out in a tough spot once. That's enough for Vic to keep hanging around him. But apparently not enough marry. It's pretty clear he has low self-esteem and feels Vic is too good for him. He tries hard, which Vic respects. This cadre of characters are very believable: These are real people trying to stop a serial child murderer. With that, the fantasy hook in the story is not that believable. Just how, exactly, does Charlie Manx take the kids to Christmasland? How is Vic McQueen able to follow them? It's not explained well, but that's OK. I would have preferred no explanation rather than a bad one. In an extremely predictable plot-twist, FBI agent Tabitha Hutter defers to Vic's craziness to let Vic go chase her son. "I should not let you go, but I think I actually believe you. Go save your son." Unlike the FBI agent, I was not satisfied with the reasons up to this point. Though Vic performed something impossible, there was still reason within grasp. My complaints are minor. "NOS4A2" easily gets my highest score. This is my new favorite horror novel. P.S. I don't normally call out the audiobook directly in my reviews. The format people consume books is simply a preference. Some like to read. Some like to listen. For this book, I listened to the narration by Kate Mulgrew (Captain Janeway from Stark Trek: Voyager). She did an absolutely amazing narration. She squeezed every bit of emotion from every sentence and gave each character their own voice and intonation. If you are a fan of the audiobook format, this is an easy recommendation. 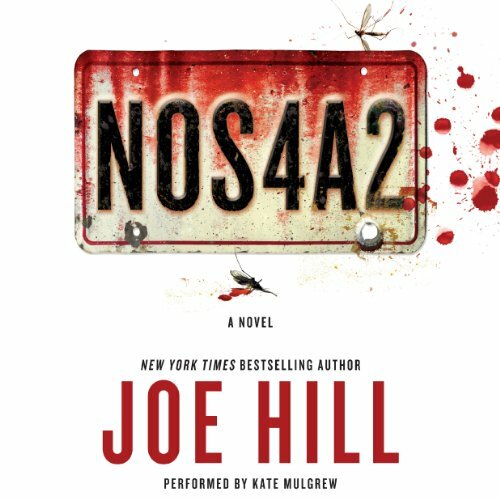 Discuss NOS4A2 in the forums.